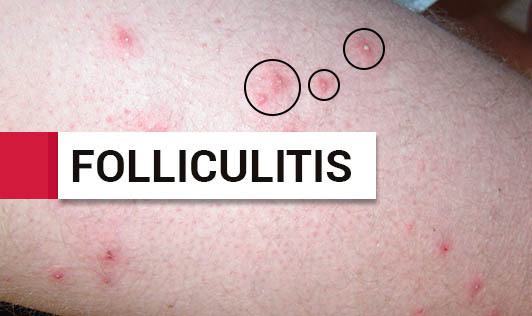 Folliculitis is the inflammation of one or more hair follicles and can occur anywhere on the skin often infected with Staphylococcus aureus or other bacteria. There are variations of folliculitis known as hot tub folliculitis and barber' itch. Severe infections can cause permanent scarring and hair loss. Mild folliculitis can be uncomfortable and upsetting. If the infection doesn't improve, see your doctor as you may need antibiotics to help control problem!